"This is a delicious, simple, fast sauce. Best for beef roasts. Fabulous on tenderloin roast!" Whisk sour cream, prepared horseradish, salt, and pepper together in a bowl. Refrigerate until chilled, about 15 minutes. 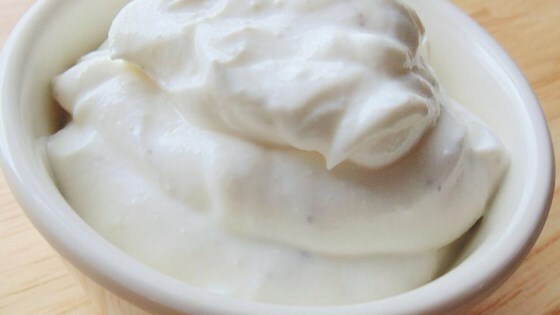 See how easy and delicious it is to make horseradish sauce from scratch. Light or fat-free sour cream can be used in this recipe, if desired. My go-to horseradish sauce for corned beef and prime rib. Very easy and tasty. If I make it again I would use about half the horse radish and make only a third of the recipe. It makes a lot. Full amount of horse radish was a bit much. Added a dash of dill, great on steaks! I made this, the only alteration I made is I added a squirt of mayo to make it a little sweet. Great recipe! A hit in this house!